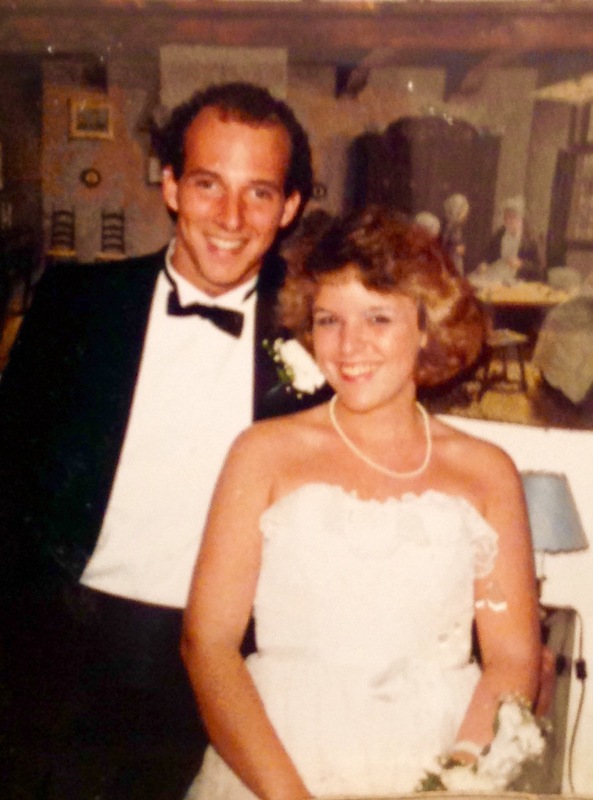 Jay & I shortly after we started dating in 1985. The workers building a retaining wall at my house had only talked to my husband and hadn’t yet met me. That particular day, I’d been gone when they arrived and got back after they were hard at it. The foreman saw me pull up and waited for me to get out of the car. “Well,” I told him, getting the groceries out of the car, “I’m his first wife.” I walked on towards the house. “Um,” the man clearly wanted an end to the awkward silence, but couldn’t seem to form any actual words. Indeed, back in the late eighties, I finished my bachelor’s degree and married my college sweetheart. Coincidently, so did my roommate and my two closest girlfriends. Today, more than two decades later, all four of us are still happily married. Talk about non-traditional marriage: according to today’s statistics—at least two of our four couples should be divorced by now. No matter what Americans believe about marriage, surely we can all agree that the rapid dissolution of so many families is alarming. I know a number of couples who have suffered divorce and listen, they all have valid reasons: chronic unemployment on the part of one spouse or the other, affairs, addictions, and just plain irreconcilable differences. Without question, marriages often fail despite the determined efforts of one or even both of the partners. And sometimes, marriages should be terminated long before they are: I’m talking about abuse here—physical, sexual, psychological, and emotional. Seriously, if you are in an abusive relationship, get out immediately. You and your children will be better living in a shelter than with an abuser. No exceptions. But back to my college friends & me. What has held our marriages together? One could argue that church-going is one thing. All four of us go as couples with our children to church on Sunday mornings and every other time the doors are open. But you know what? So do a lot of other couples who have faced divorce. Going to church is important, but it doesn’t guarantee a long-lasting marriage. The divorce statistics for couples in Sunday school are the same as for those who skip it. All eight of us are hard workers. Among us are three teachers, a couple of business people, an engineer, a scientist, and a minister (who also happens to write compelling blog posts). But none of us would be considered wealthy by American standards. In fact, each of our families have been through lean years in which one of the two spouses was laid off, under-employed, or in school for further education. Financial distress is often cited as the primary cause of divorce, yet our relationships have persisted through such troubles. Not that it’s been easy; none of us would be the millennium version of Ozzy and Harriet or Mike and Carol Brady. No, our marriages have included real-life frustrations; plenty of times it would have seemed easier to give up. So why didn’t we? I don’t know all the reasons, but I know one. See, while the divorce statistic is the same for church-goers and party-goers, church-going does not equal faith. In all four of our marriages, we’ve either found or sustained a deep and abiding faith in Jesus Christ. Over the years, despite our struggles (or maybe due to those difficulties), we’ve all grown closer to God. All eight of us have aspired as individuals, as spouses, and as family members, to know God better and to be more like Christ. All eight of us have also failed resoundingly many times; but we’ve managed, by grace, to return to the path of spiritual formation, even when detours have distracted us from our objectives. Marriage. You can hardly check a news feed without stumbling upon some so-called wisdom about it. Too bad Jesus isn’t on social media. If he were, he might say something like, “Strive first for the kingdom of God & his righteousness, & all these things will be given to you as well.” #Matt6:33NRSV #lovealwayswins. *This piece was first published on June 29, 2015, by Baptist News Global (formerly Associated Baptist Press). I’m delighted to be associated with this great organization and am honored to be among the gifted writers and thinkers featured there. Watch for my BNG column, appearing monthly at baptistnews.com.